Want to provide your visitors easy access to your website through all devices? Mobile optimization is the right choice! Mobile optimization is the best way to engage your visitors with high user experiences. As we all are aware of how mobile devices play a large role today in our daily life activities, it won’t be surprising to conclude that mobile optimized websites are now a necessity rather than a luxury. The growing trend of reaching out mobile devices to use internet has pushed mobile to the first and dragged desktop to second. 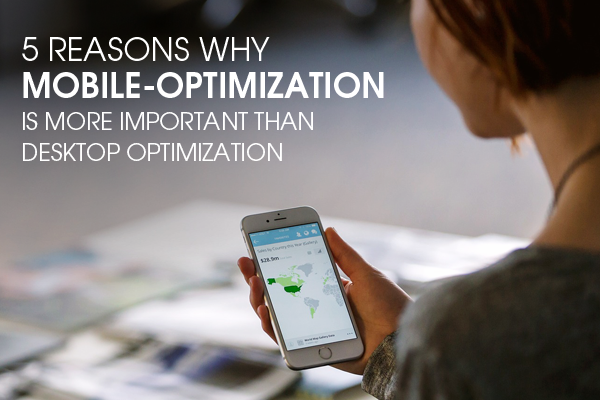 Here are 5 reasons why mobile-optimization is more important than desktop optimization. Most of the desktop websites remain buried in the search results even after implementing SEO. Mobile optimized websites shows better search results online than desktop optimized websites. Today, majority of the world depends on smartphones to access everything. The recent surveys have proved that most of the people access the web from their mobile devices when compared to any other devices. This statistics is clearly evident to prove the mobile usage in the future. Most of the digital media consumption is now recorded from mobile phones. Mobile phones are the prime source with which user’s access websites. Mobile users are your real customers for your business. They actually spend more time on your website than the desktop users. Most transaction today is also carried out through mobile devices than with any other devices, including desktops. Desktop-optimized websites have limited features that do not help in the interaction with users. Mobile-optimized websites are an easy way to engage with users by helping them with the necessary. Mobile optimization is the simplest way to attract users and to make effective digital marketing for your brand. Contact us! We can help you maximize the user experience by droving major success for your bottom line with mobile-optimization. « 8 easy steps to build your email list!